XANT set out in the mid-size wind industry to do things differently. We believe the challenges of putting up turbines in remote locations and keeping them spinning are very different from building wind power plants. We set out to fight the misconception that wind power is too complicated to be deployed and operated on hard-to-reach places or in isolated singular installations. Our Just-Enough-Essential-Parts (JEEP) design philosophy triggered us to think out of the mould. 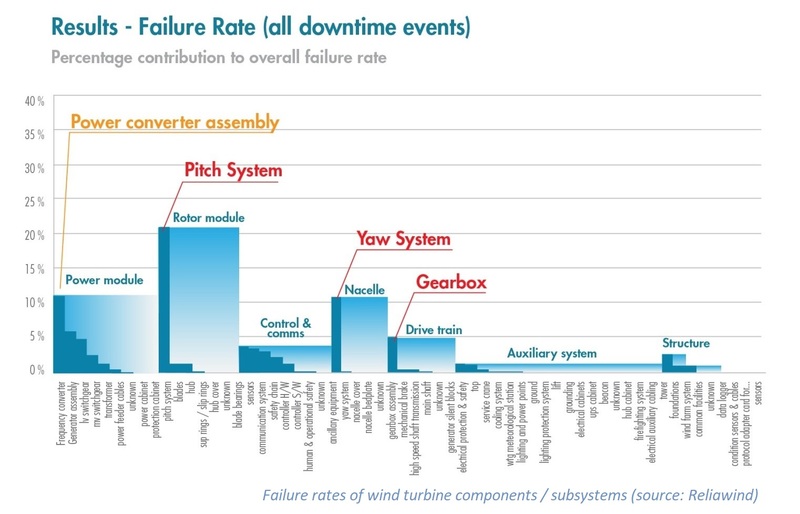 Our starting point back in 2009 was a study on reliability of wind turbines in which most of the leading manufacturers contributed with observed failure rates of components and subsystems over a large sample of turbines. The main culprits for down-time were the gearbox, the converter, the yaw system and the pitch system. The latter being the failure-champion, the XANT engineers decided to do without and use stall as the method of controlling the power output. Stall is the aerodynamic phenomenon of air layers detaching themselves from the surface. Once stall occurs, the lift coefficient drops and the torque (and thus the power) on the turbine shaft decreases. Pitch systems continuously adjust the angle of attack of the blade to avoid stall at higher wind speeds and control the power output. With pitch control the rated power can be maintained at above-rated wind speeds. Stall requires no sensors, no connections, no motors and no maintenance. Stall turbines however have the disadvantage that a compromise needs to be made regarding performance at high and low wind speeds. Either the power curve tends to drop off at above-rated wind speeds or rated power is achieved at a higher wind speed. Either way this results in a lower yield when compared with a pitch-controlled machine of the same size. To off-set this effect, XANT uses aero-elasticity: the flexibility of the blade structure induces a change of the shape of the blades under high aerodynamic loads. XANT turned this undesiredeffect into an effective means to induce a “passive” pitch instead. To obtain this the blade planform of the XANT turbines is swept back, creating a lever arm for flap-wise bending resulting in torsional twist. The induced blade twist varies along the span of the blade is very dependent upon the structural lay-out of the blade. Over the past 10 years, XANT has conducted research in collaboration with DTU in Denmark and TU Delft in Holland to finely tune the blade lamination plan to get the desired results. 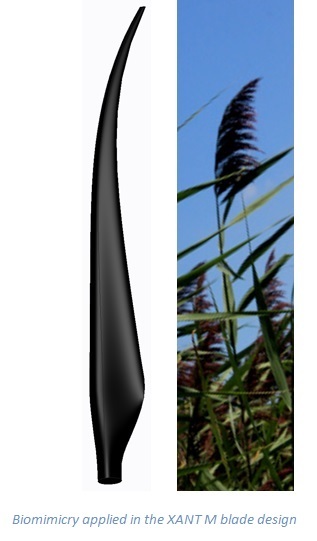 The XANT M blade design is a great example of biomimicry. The reed’s strength is in its ability to bend when the wind blows; the XANT M blade mimics this behavior with its aero-elastic design enabling a longer blade (and this higher yields) without increasing the mechanical loads. Robustness or yield. Why choose? And the results are quite spectacular: the XANT M-21 achieves rated power at 11m/s and maintains this power level all the way up to the cut—out wind speed without any drop-off effect. The combination of aero-elastic “tailoring” of the blade structure and the variable-speed operation achieves optimum performance at low AND high wind speeds. Notice how in the graphs below the competing products had to make a choice between low rated wind-speed or rated power at high wind speeds. XANT wants to do things differently and prove that simplicity and robustness, key for deploying wind in remote regions, do not necessarily lead to compromising on performance. The XANT M blade with its patented passive-pitch design is a clear example of this approach.